Worried about hackers taking a crack at the cards stashed in your pants? The year's most low-tech "wearable" has your back (pocket). Clothing maker Betabrand is currently running a crowd funding campaign for RFID-defeating clothing in partnership with PC security firm Norton. The line-up includes a $198 blazer and a pair of $168 jeans. 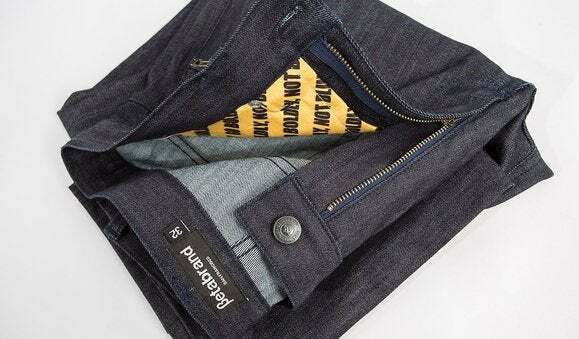 The ‘Ready Jeans Protected by Norton’ feature two pockets—one in the front and back—protected by RFID-blocking fabrics. The clothing should protect your credit cards, passports, and other RFID-enabled items from bad guys looking to get friendly with an RFID reader. It’s not clear what Norton’s contribution to the project is, but it appears the company is just lending its name to the new clothing. Why this matters: Radio frequency identification (RFID) chips use radio waves to transmit data such as your credit card details through the air to data-reading terminals. Ever since RFID became standard fare, security experts have been warning how easily these chips enable data theft with a simple RFID reader. Norton says more than 10 million people get their data pick-pocketed via RFID every year. This concern has led to RFID-blocking wallets, cell phone cases, and passport holders, so why not pants? It may not be that long before anti-RFID fabric is built into not just Betabrand's clothing but plain old Levi’s too. Betabrand is an interesting San Francisco-based company that decides whether or not to produce new products based on the success of crowd-funding campaigns. The ideas for its products also come from a mix of company and customer concepts. Right now, the crowd funding campaign is looking up for the jeans, as the product has already surpassed its goal and will start shipping in February. The blazer, however, isn’t getting a big reception and is only 20 percent of the way to its goal. If you’re interested in a pair of the jeans you can pick them up for 10 percent off the sticker price at $151 and change through the end of the crowdfunding campaign. UPDATE (12/17): This story was updated to correct the name of the company Betabrand. We regret the error.